I always loved the photo I took of the rocks on our beach up in New Brunswick, Canada several years ago. 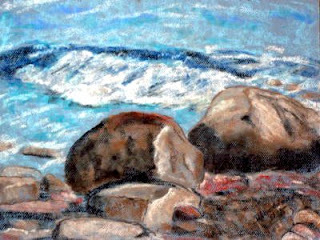 In fact, back in 2005 when I first began to learn about using pastels, it was one of the first pictures I wanted to paint. So I tried and tried, and I was so frustrated as I *knew* in my mind what I wanted to create, but just could not seem to get it down on paper. I just didn't have the skill or the learning or the experience to be able to create on paper what I could see in my mind's eye. But after four years of working with pastels I decided the time was ripe to try it again! I still wanted to do that rock scene! And this time it seemed to flow so much more easily. I felt happier with what I was doing, and more confident that I could achieve a result that pleased me. So I created the above on a 9x12 sheet of Art Spectrum Colourfix, and I'm much happier with the result than I was with my original 2005 attempt. To show you the differences, here is the 2005 attempt below, back when I was a fledgling artist, rather than one who is slowly coming to be happy with my own style.